A lone gunman killed at least 26 people and injured many more at a church in Sutherland Springs. The tiny town was left reeling from the deadliest shooting at a place of worship in American history. Morning services at the First Baptist Church of Sutherland Springs, a tiny town about 30 miles southeast of San Antonio, became the scene of a massacre Sunday after a lone gunman killed at least 26 people and injured many more in the deadliest shooting at a place of worship in American history. The number of casualties, which could rise, also made the shooting the deadliest ever in Texas. “Everything you see here is what I see happening in other states, but I never thought it’d be this close to home,” said Rita Serna. The 50-year-old woman, who lives 20 miles away from Sutherland Springs' First Baptist, attended the church during her entire childhood. She was among about 100 people at a vigil for the victims Sunday night. Members of the devastated church did not attend the gathering, but scores of other people and Gov. Greg Abbott came out under a deep orange moon to support First Baptist's congregants. Abbott traveled to the area hours after the shooting. "This will be a long, suffering mourning for those in pain. These people were innocently gunned down," Abbott said earlier Sunday at a news conference in the nearby town of Stockdale. Officials at the news conference said that 20 more people were wounded, with injuries ranging from "minor" to "very severe." The victims ranged in age from 5 to 72. Police did not name the gunman, who is also dead, and they declined to name any of the fatalities as they worked to verify the identities of the more than two dozen people slain. Law enforcement said it was too early to speculate on a motive for the killings that left the town — and the country — reeling. 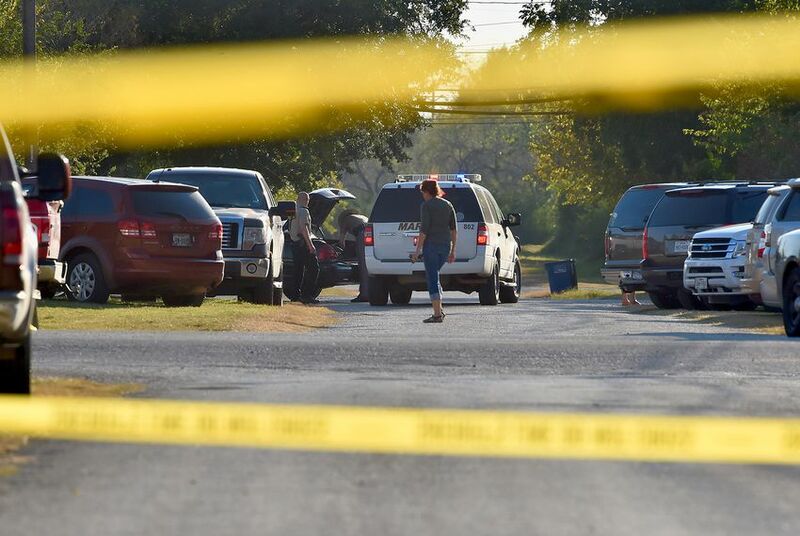 U.S. Rep. Henry Cuellar, D-Laredo, who represents the area, told The Texas Tribune on Sunday evening that the victims include the 14-year-old daughter of the church's pastor, as well as a pregnant woman. He also said the shooter was Devin Kelley, who was from Comal County, about 50 miles north of Sutherland Springs. The Associated Press late Sunday reported that Kelley served in the Air Force and was court-martialed in 2012 "on one count of assault on his spouse and another count of assault on their child." Citing an Air Force spokesperson, the news agency said "he received a bad conduct discharge, 12 months' confinement and a reduction in rank." Texas Department of Public Safety regional director Freeman Martin described a harrowing and tragic scene that began around 11:20 a.m. Sunday. The gunman, who Martin said was a "young, white male, maybe in his early 20s," was spotted dressed all in black at a gas station across the street. He wore tactical gear and a ballistic vest, Martin said, and had an "assault-type" rifle. Police later found more weapons in the man's car. As the gunman approached the church, morning services were underway, according to Wilson County News editor Nannette Kilbey-Smith. The congregation might typically consist of 50 people, news outlets reported, citing videos of previous services at the church. The shooter fired as he walked toward the church and once he went inside. Twenty-three people were later found dead inside the building. Two were found dead outside. Another died from injuries after being transported from the scene. When the gunman left the church, a local resident confronted him. The shooter dropped his weapon and fled in a vehicle as the resident pursued, Martin said. At some point, the man ran off the road, and police found him dead in his car, but Martin said it wasn't clear if the man's death was "self-inflicted" or if a local resident had killed him. The local resident who confronted the gunman wasn't injured. Cuellar said he is familiar with Sutherland Springs after taking frequent trips there for parades, small fundraisers and to meet with volunteer firefighters. Just a few hundred people live in the town. "It's so small, and you just go a few blocks and it's over," he said, adding that the small population will probably only magnify the grief. "Everybody's going to know people that got killed or people that got hurt," he said. Before Sunday, the worst mass shooting in Texas history happened in 1991 when George Hennard drove his truck into a Luby's in Killeen before he shot and killed 23 people, injured 20 others and fatally shot himself. In 1966, the University of Texas at Austin was the site of the nation's first mass shooting on a university campus when a man fatally shot 16 people, plus a pregnant woman's unborn baby, and wounded more than 30 others. The killings in Sutherland Springs occurred on the eighth anniversary of a mass shooting at Fort Hood, in which 13 people died. People attending the vigil Sunday night gathered in a small grassy patch near the local post office, with the blue First Baptist Church sign illuminated in the background across the town’s major highway. They held candles, sang songs, prayed and held each other as the tears streamed from their faces. “It’s such a small church, you didn’t think something this big would have happened,” said 13-year-old Douglas Peterson, who stood with tears in his eyes as his mother clutched his arm. Shortly after Sunday's massacre, Abbott released a statement calling it an "evil act." "I want to thank law enforcement for their response and ask that all Texans pray for the Sutherland Springs community during this time of mourning and loss," he said in the statement. President Donald Trump, who is in Japan, said via Twitter that the FBI and law enforcement "are on the scene." "May God be w/ the people of Sutherland Springs, Texas," he wrote. On social media, some Texas officials called for prayers while others called for tighter gun control laws. "As details become more clear from the senseless violence at First Baptist Church in Sutherland Springs, please pray for all those affected," state Sen. Donna Campbell, R-New Braunfels, said in a tweet. Many Democrats, however, pointed to the deadly shooting — which comes just weeks after more than 50 people were fatally gunned down during a country music festival in Las Vegas — as evidence that the nation needs to tighten gun ownership laws. U.S. Rep. Lloyd Doggett, D-Austin, said on Facebook he was "determined not to let this horrible and unnecessary loss of life be ignored." "Once again gun violence destroys lives, while this Congress, owned lock, stock, and barrel by the NRA refuses to act," Doggett said. State Rep. Poncho Nevárez, D-Eagle Pass, tweeted thinly veiled criticism of the National Rifle Association: "Faith without works is not Faith. #NRA." Attorney General Ken Paxton suggested to Fox News on Sunday afternoon that there should be "professional security" at churches and other places where many people gather. But Paxton also expressed doubt that stricter gun control laws could influence the frequency of mass shootings. "I wish some law would fix all this," he said. "The reality is, if somebody is willing to kill someone, changing gun laws probably doesn't affect that person. What you have to do is you have to allow citizens to protect themselves." Serna, who attended the church as a child, said the community has to trust God will show his light. She recalled the first song she sang solo in the church turned crime scene that stood less than a block away. “The chorus of it was ‘In God we trust,’ and that’s basically what we have to do is trust in God through it all,” she said. Jolie McCullough reported from Sutherland Springs. Abby Livingston reported from Washington, D.C. Bobby Blanchard and Cassi Pollock contributed to this report.